Nollywood news + Naija Gist | Yoruba movies, Naijagist, Nigerian music, Naija news, Nigerian movies: Small Doctor arrested with a gun in Oshodi, threatens to shoot a policeman. 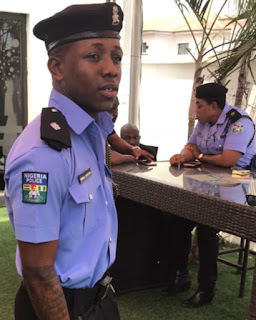 Small Doctor arrested with a gun in Oshodi, threatens to shoot a policeman. Popular street-hop singer, Adekunle Temitope popularly known as Small Doctor has been arrested by the Nigerian Police force in Oshodi area of Lagos for unlawful possession of firearm and allegedly threatening to shoot a police officer. Lagos State Commissioner of Police, Edgal Imohimi confirmed news of the arrest while parading the music star alongside his three other men believed to have been in his company when the incident occurred. He Said they were arrested after they came out of their SUV vehicle and threatened a police officer on traffic duty along Oshodi, Lagos that if he does not leave the road they will shoot him. He Further revealed that Small Doctor will be charged to court for prosecution.